PURCHASE, NY – September 24, 2015 – Humanitarian organizations are increasingly asked to provide aid in a climate of political and economic unrest. The chip-enabled card can be pre-loaded with a parcel of eligible physical goods – from food to medicine to shelter – and distributed to populations in need. Participating merchants are equipped with a visual, user-friendly terminal. Beneficiaries only need to dip their card, select the desired items, such as weekly groceries, by tapping the corresponding photos on a screen, and enter a PIN to safely confirm their transaction and receive their goods. According to a recent report by the High Level Panel on Humanitarian Cash Transfers, the humanitarian system is under severe stress. With nearly 60 million people around the world displaced by conflict in 2014, and 218 million people a year affected by natural disasters, organizations need new tools to meet the rising demand for aid. Rapidly Deploy the Service – Simplified training, a web-based aid program set-up and no need to integrate with local financial service providers enables faster aid delivery. Operate in remote, inaccessible locations – Merchants do not require connectivity to be able to conduct a transaction, so the humanitarian interventions can be deployed anywhere. Reduce Costs and Risks – Cards are distributed once and reused for each transaction, eliminating the need for staff travel for voucher distributions and collections. Beneficiaries go directly to the merchants to collect their aid. Expedite Payment to Merchants – Transactions are digitally captured, eliminating the counting of paper vouchers and record keeping and enabling aid organizations to speed up payments to their vendors. Increase Transparency – Unlike paper voucher systems, NGO staff can see the actual items a beneficiary purchase with their vouchers and quickly review merchant reports, eliminating concerns of voucher fraud. Empower Beneficiaries with Technology – The chip cards offer a first step towards financial inclusion by providing experience with a payment tool. This continues the company’s support of the development community, including the recently announced partnership with the Food Agricultural Organization (FAO) to create an innovative new alliance against hunger. MasterCard (NYSE: MA), www.mastercard.com, is a technology company in the global payments industry. We operate the world’s fastest payments processing network, connecting consumers, financial institutions, merchants, governments and businesses in more than 210 countries and territories. 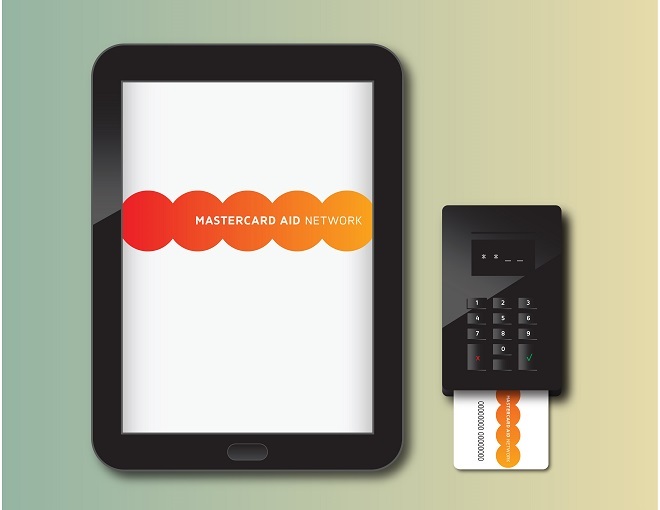 MasterCard’s products and solutions make everyday commerce activities – such as shopping, traveling, running a business and managing finances – easier, more secure and more efficient for everyone. Follow us on Twitter @MasterCardNews, join the discussion on the Beyond the Transaction Blog and subscribe for the latest news on the Engagement Bureau.